An analysis of data and isolates from the Gonococcal Isolate Surveillance Project (GISP), led by the Centers for Disease Control and Prevention (CDC), shows declining susceptibility to the drug azithromycin from 2013-2014. Azithromycin is one of two drugs in the recommended dual therapy treatment for gonorrhea. The CDC’s STD Treatment Guidelines currently recommend an injection of ceftriaxone and an oral dose of azithromycin for gonorrhea treatment. The surveillance summary, titled Neisseria gonorrhoeae Antimicrobial Susceptibility Surveillance —The Gonococcal Isolate Surveillance Project, 27 Sites, United States, 2014, is published in the July 15 issue of the CDC’s Morbidity and Mortality Weekly Report (MMWR). "Antibiotic resistance in Neisseria gonorrheae, and in many other bacteria, is a growing concern globally," says Carlos del Rio, MD, an author of the report and principal investigator and director of the Atlanta GISP Reference Laboratory. Del Rio is also a member of the Antibiotic Resistance Center at Emory University. Del Rio also stated that gonorrhea could soon become an untreatable infection and thus, "it is essential that we continue to monitor closely for the development of antibiotic resistance as well as the effectiveness of antibiotic therapy and conduct research to develop new drugs and make our current drugs more effective." According to the report, in contrast to previous resistance patterns these increases in drug resistance occurred in all parts of the country. According the MMWR report, it is too early to know if the declining antibiotic susceptibility of gonorrhea to drug therapy is a trend, but the data are concerning because gonorrhea is known to rapidly develop resistance. Also, widespread resistance could have major treatment implications, since azithromycin is also the basis of every alternative treatment. 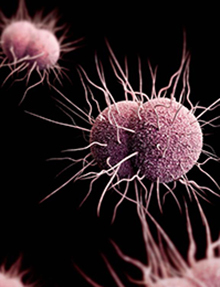 Even more concerning, this new threat is emerging at a time when gonorrhea rates continue to rise while resources to fight it continue to fall. While further research is needed, the data supports the recommendation of not using azithromycin as monotherapy to treat gonorrhea and reminds clinicians that they must follow the recommended dual therapy and stay up-to-date with any changes to the treatment recommendations, say the authors. Routine screening, as well as partner notification and treatment, still remain key to preventing infections.